UNBEATABLE LOCATION, AMENITIES AND VIEWS! If you have been to Steamboat before you have seen this condominium building. It's distinctive shape & bronze coloring curves around the mountainside adjacent to the old Christie lift. Panoramic views of the ski slopes and the Yampa Valley from every window & the huge private balcony. Bronze Tree is a one-of-a-kind amenity complex. Ski-in, Walk-out. Indoor heated pool, indoor hot tub, outdoor hot tub, sauna, exercise fitness center, ski locker at front door, elevator, sundeck, BBQ gas grill, plenty of parking outside of unit or you can park in the covered underground parking area. Short walk to Ski Time Square for the free city shuttle, restaurants & shops. During ski season there is a on-call, on-demand shuttle. No car needed when you stay here. Kitchen is fully equipped, great appliances, flat screen TV's in both bedrooms with DVD players, new mattresses and linens. There is a king bed in the master & the 2nd bedroom has 2 queen beds. Living room has 55' Samsung LED LCD TV with BluRay & stereo, gas log fireplace, pull out sofa sleeper, free Wi-Fi and much more. When you rent this unit you get the best of both worlds. 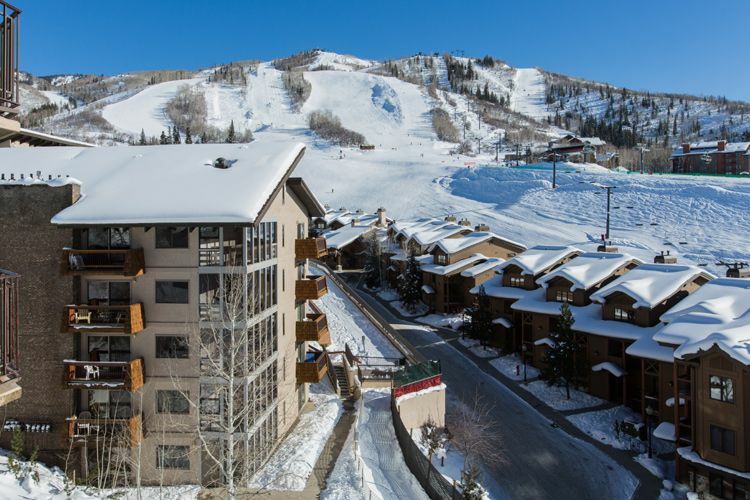 Owner rates and local management by Condos-in-Steamboat for personalized service. Condos-in-Steamboat can organize your shuttle transfers, super discount lift tickets, discount ski equipment rentals and much more. Rent from local people and get the ultimate vacation experience. *Depending on your dates I can save you over $50 per day, per adult off your lift tickets depending on your dates. Massive savings on lift tickets. Kids Ski Free. Restrictions apply on length of stay, minimum purchase on lift tickets. Call Kim Filler at "Condos in Steamboat" for details. You must reserve your lodging more than several weeks in advance to have the time to order discount lift tickets. The discount does change depending on your dates & when you book. The earlier you book, the more you save! Don't assume, please ask questions via email or call. This unit is managed by Condos in Steamboat. Kim and Dan Filler, owners of Condos in Steamboat have lived, worked and played in Steamboat for over two decades. We will make sure you vacation is one to remember. You will keep coming back to Steamboat year after year - we promise! We all had a great time. The condo was very clean and stock with all the amenities we needed. The guys lived the ski lockers provided and us girls loved the place. The beds were very comfortable and we had enough room. The kitchen was well stocked with everything we needed to make all our meals. Everything is very close to the property and there is a shuttle available if needed to take you anywhere you needed to go. The hot tub was amazing and helped the guys relax after a long day of skiiing. It helped me out too cuz I have bad hips and the hot tub helped with the aches and pains. Thanks again. We will be back when we visit Steamboat again!!! Kim at Condos in Steamboat ALWAYS has everything in order. Condos are exactly as described online. Kim takes care of everything every time. There are simply no goof ups. We are grateful for her efforts. We won't stay with anyone else in Steamboat.